Eucalyptus Essential Oil comes from the Eucalyptus tree. The tree itself is native to Australia, though it is now grown worldwide. It is widely known for being useful as a decongestant, clearing the airways during colds. It also has potent anti-bacterial and anti-viral actions. 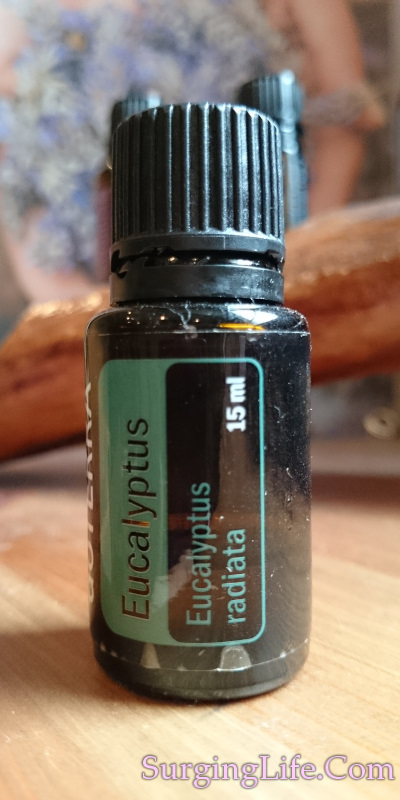 You can discover more on Eucalyptus Essential Oil Uses on the lower part of this page. The tree itself is an evergreen that can grow to over 60 meters in height, and is part of the Myrtle family. The leaves hang downwards and are a glossy or waxy green in colour. The leaves are covered with oil glands too, something which is notable with this species. The trees, and their leaves, produce a large amount of resin and oil. This high production of oil and resin leads to the blue haze which gives the Blue Mountains, in New South Wales Australia, their name. The essential oil is gathered via steam distillation from the leaves of the tree. It is initially colourless and yellows with age, and is clear in nature with a watery or thin viscosity. Aroma wise it has a top note that is penetrating, camphoraceous, woody and fresh in nature. The principle constituents that yield the properties given are eucalyptol (1,8-cineole), ethyl alcohol, amyl alcohol, camphene, eudesmol, limonene, phellandrene, a-pinene, b-pinene, aromadendrene and various aldehydes. Excessive use can cause headaches. People with high blood pressure and/or epilepsy should avoid it or be very cautious with its usage. China produces around 75% of the traded volume each year, however the majority of the product coming from there is synthesised from Camphor oil fractions. As such the majority of Chinese product lacks the same healing properties present in genuine Eucalyptus Essential Oil. So be careful when sourcing the oil you are going to use. Effect of freezing, hot tumble drying and washing with eucalyptus oil on house dust mites in soft toys. "Soft toys are a major source of house dust mites (HDM) and HDM allergens, and sleeping with soft toys is a significant risk factor for HDM sensitization... Freezing, hot tumble drying and washing with eucalyptus oil resulted in significant reductions in live HDM, an average reduction of 95.1%, 89.1% and 95.1%, respectively. Additionally, washing with eucalyptus oil resulted in a significant reduction in HDM allergens as well from a geometric mean of 9.12 μg/g to 0.37 μg/g (p = 0.033)." Chang CF, Wu FF, Chen CY, Crane J, Siebers R.
Pediatr Allergy Immunol. 2011 Sep;22(6):638-41. doi: 10.1111/j.1399-3038.2011.01144.x. Epub 2011 Feb 21. Eucalyptus essential oil uses run far wider than just being useful for colds and issues of congestion. Whilst the aromatic effect of this oil is incredibly good for clearing the excessive mucous experienced during heavy colds, catarrh, hayfever and other such conditions. It is also a great aid when treating various viral conditions including malaria, chicken pox and measles. On top of this it is also very good for aiding with healing wounds and cuts too. Basically it is incredibly versatile and helps with many conditions. Eucalyptus has a wide range of effects, rather than making it weak and diffuse though it is strong in a great many areas. Its healing properties, power to clear viruses and bacterial infections, plus its action on fevers are exceptionally good. Plus as is well known it has an extremely good effect on respiratory issues involving the mucous membranes for the specific action it has there. Definitely best known for the respiratory element of its properties, especially in clearing and healing the mucous membranes, many of its other qualities get overlooked. It is helpful when dealing with cuts and wounds in a diluted, mild, wash it acts as an antispetic and also helps to improve healing time. It is also a potent antiviral and can help clear many viral issues, when paired with Bergamot it has been noted as being effective against Herpes Simplex. Also of note is the cooling and deodorizing effect that it has on the body. This is a powerful oil, in many ways. One whiff of the aroma it yields and you will note the strength it has in that way, something which mirrors many of the strengths it has through its therapeutic qualities. When dealing with this oil be cautious how much you use, over use can cause headaches, it can also become harsh on the nasal passages if used too heavily when clearing mucous and respiratory issues. Be careful in your usage and you will get great results from it. Having a good quality supply is always recommended. Eucalyptus essential oil uses are many and varied and when using a quality source, as well as using it carefully, you can achieve amazing results with this oil. Discover more on essential oils and where you can get high quality Eucalyptus essential oil.